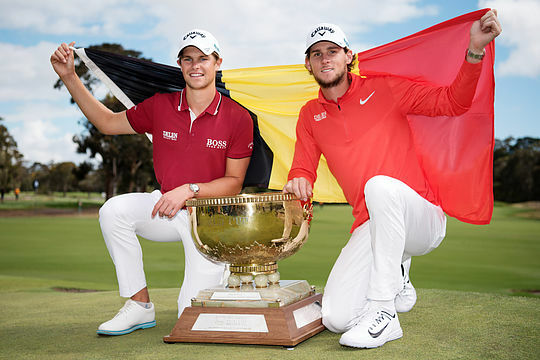 Belgium has withstood a late charge from Australia’s Marc Leishman and Cameron Smith to win their first World Cup of Golf at Melbourne’s Metropolitan Golf Club. The Australians had a string of three straight birdies on the back nine to mount a spirited charge for the title but Belgian duo Thomas Pieters and Thomas Detry held their nerve for a three-shot win, with Mexico also tying for second. Starting the final day with a five stroke buffer, both Pieters and Detry held their nerve during the alternative shot foursomes and their history of playing junior golf together was evident as the pair combined brilliantly and were at ease playing the challenging format. “We’ve known each other since we were 8 and 9 years old,” said Detry, the world number 140. US Collegiate life at the University of Illinois certainly shaped a lifelong friendship between the Belgium pair. Pieters won the individual 2011 Jack Nicklaus Invitational and the individual 2012 NCAA Division I Championship in his second year. Detry was named the Big Ten Freshman of the Year in 2013 and the Big Ten Golfer of the Year in 2015. “We’ve been friends for a long time, same high school as well,” said Pieters, the world number 70. The Aussies had the vocal home town Melbourne fan base pushing them all the way until the end. World No.21 Leishman, the highest ranked player in the field, missed a short birdie putt on the 16th which would have put them within one shot of the leaders. The sound of disappointment was heard throughout the course. Yet in true Aussie spirit Smith and Leishman continued to battle and when Smith also missed a birdie putt on the 17th their fate was sealed. “We put up a good fight,” said Leishman. Smith was also equally happy with the way the Australian team bounced back into contention. Defending champions Denmark came third along with Canada.